Every piece that comes from Son of a Sailor is hand-crafted in our Austin, Texas Studio. William and Jessica design each item with a specific function and meaning in mind, and often times the products have a unique story. Our talented team works together to produce each piece with a keen attention to detail, and we take pride in our process. We’d love to give folks a little bit of insight into how we do things, why we give our items their names, and what the process looks like! 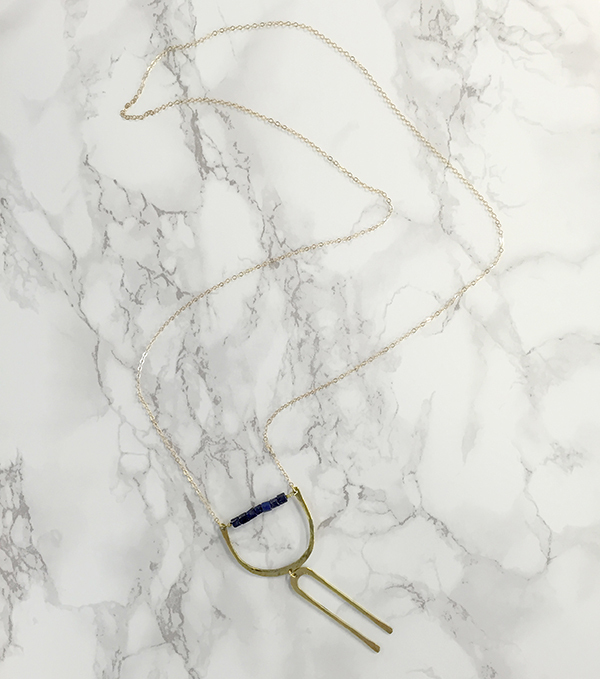 The Teo is a brass pendant necklace featuring a strand of gemstones on a 36” long 14k gold fill chain. First introduced in the Stela line, the Teo is designed as an heirloom piece.The Teo features the two shapes that launched the rest of the collection. Jessica is here to tell us the all about the Teo, its name, and how it came together. 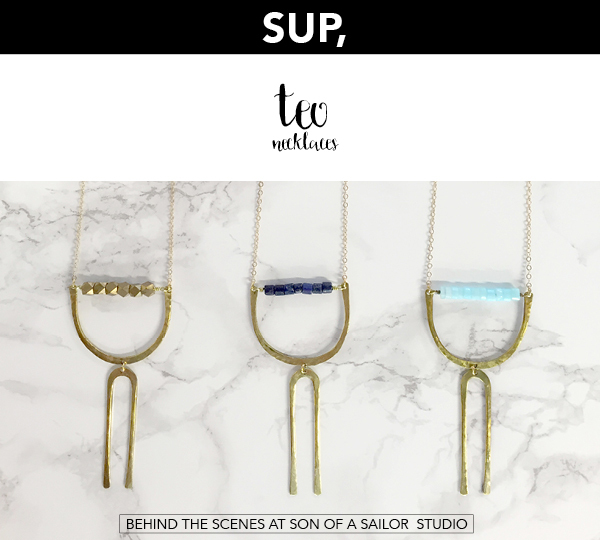 "The Teo is part of a set of necklaces in the Stela line, which we affectionately refer to as the 'T’s,' the Tia, the Tey, and, of course, the Teo. They are built on the same geometric shapes and share the same color-blocked gems. The angles and arcs give the Teo a very glyphic feel, and coming from there, we knew we wanted to bring in that element of the ancient to the Stela line and give it a timeless feel. All of the jewelry in Stela is named after ancient Egyptian queens, and the T’s take their name from different spelling ways of queen Teo." Then, we drill, grind, and polish the shapes. 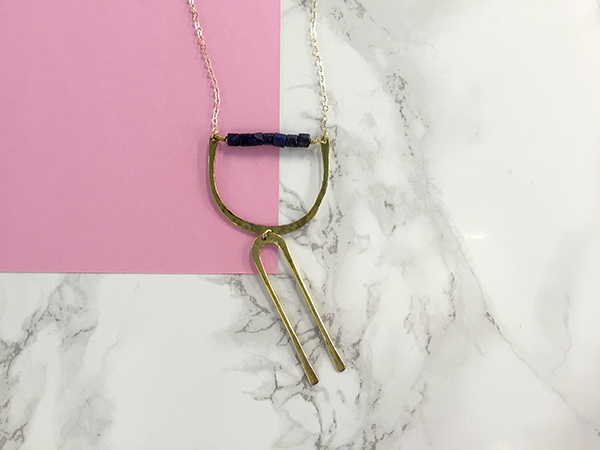 Each necklace has a colorblock of gemstones or brass that is then wire wrapped. Finally, the shapes are assembled and connected to the chain." "When designing the Teo, we wanted to continue the SOS story. We drew from the geometric shapes that have been with us from the beginning. We based our new design on very simple shapes we had used in the past, and came up with the rectangle, triangle, and arc that are seen throughout the Stela collection. Billy and I have always loved that pop of color and we wanted to carry our signature colorblock technique to the new line. We did this by adding a strand of gemstones. We carefully chose the six colorways, made up of 5 gemstones and brass to keep that great pop while maintaining an heirloom quality." How do you wear the Teo? "My favorite part of the Teo design is the way it reacts to the movement of your body. It dances around and adds a sense of whimsy while its shine and gemstones maintain a luxurious feel. I love having the Teo in my closet because it adds to every outfit. I wear it out frequently, the gold shine and gemstones make me feel like a million bucks and I still love the way it fits so well with my favorite pair of jeans. 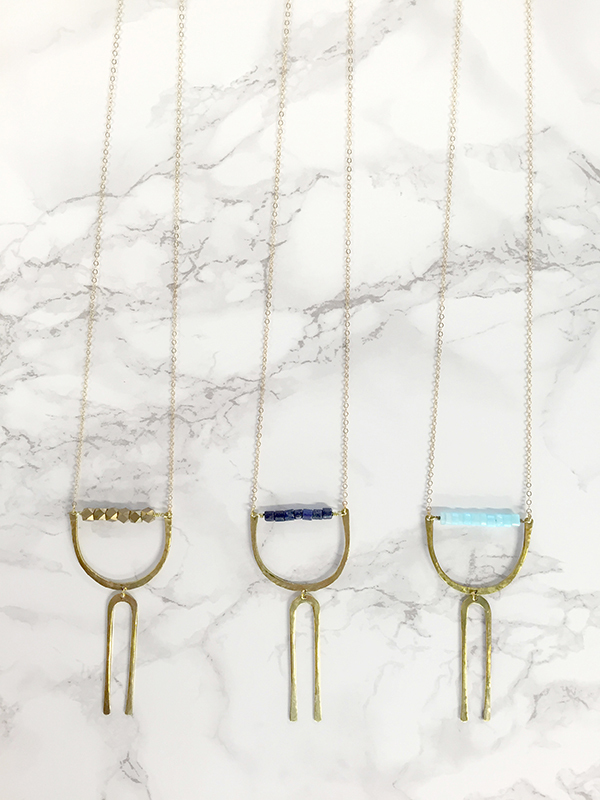 It’s the perfect length to layer, too, and I love a new addition to my favorite necklaces. I’ll even add another shape with a Kiya, if I’m feeling crazy." You can find the Teo and the Stela line online at sonofasailor.co or come see us in our studio at canopy.